Keep your Samsung Galaxy S8's screen in pristine condition with this Olixar Tempered Glass screen protector, designed for full coverage of your phone's screen. This design leaves space for a case. I'm very clumsy and keep dropping my phone, I am now on my 4th screen protector and they have saved needing a replacement screen every time. Will be buying another when needed!! Fits perfectly just take your time and you'll be more than happy. Product fits fairly well on the screen and was easy to apply. There is a definite decrease in touch sensitivity, especially in the middle of the screen. I was also disappointed because I woke up with a crack on my screen about 2 weeks after I got it. I have not dropped my phone or had any thing that should have caused it. Since then the crack has slowly been getting bigger. Excellent product comes in a pack. Great protection for your screen. Good quality. This screen protector was easy to apply but it left 2 lines down either side of my screen. I had it about 1 week and it already had scratches on it. Then I dropped my phone from my hand onto my dinner plate (it fell about 10 inches) and it chipped and then split straight across. The case has a good quality, however my phone screen's sensitivity has been reduced significantly. Comparing to other cases I have bough in the past, this one hasn't cracked at all. By far, the best case I have got online, but definitely will try others in the future. The cover cracked after one day. Dropped on wood from less than a 10 centimetre drop. Very flimsy. Wouldn't buy this product. I was amazed how easy it was to fit this screen, especially with the fitting device. It looks good too. absolutely what I was looking for. I'm very clumsy and have dropped my Samsung galaxy S8 several times! Even one drop from over 12 foot! The screen protector has saved the screen every time. Well worth the cost. Within 2 days the protector had a crack across it. But overall it's good product. This is the only protector that I have found that does not lose the touch sensitivity. It adheres very well even after my couple of attempts to align it to my screen in the first place! Also I am quite clumsy and have dropped my phone on several occasions and the screen has not a crack or a chip in it. It is not the cheapest on the market but well worth paying the extra. I would highly recommend this screen protector. Bought this a few months ago. Easy to install. Within a couple of weeks a crack appeared toward the top of the screen, don't know how. Now travelled up to left-corner of screen. Couple months ago 2 other cracks appear on the left side of the screen and travelling. Will need a replacement screen protector soon! No problems fitting and works well. First thoughts were good, easily applied to my phone no air bubbles however after having this screen protector on my phone for 6 days it has lost its adhesive and started coming apart from the phone. Really disappointing! I quite enjoy this protector, I'm able able to use whatever Case I would like! The glass feels more natural and doesn't take away from the beauty of the phone, while still keeping it protected. All in all, a great product! This replaced an identical screen I fitted a year ago with which I was really pleased. This time, having used all the cleaning equipment and followed the online instructions, I was disappointed to find the adhesive too weak to hold the screen in place and it fell off and cracked on hitting the ground after one week. This product has been proven to work pretty well on my wifes S8 and my S8 plus which I owned previuosly to my Note 8 with which I also use this protector. I would only purchase from Mobile fun, they ship quickly and back up their products. My wifes recently cracked and a few emails later a new one was being shipped. Quite fiddly to get in the right position, fits well when is in position, have never known a product show as many finger print marks/smudges as this does and looks terrible when screen off and just black screen visible as all you see is marks. Firstly this protector fits perfectly with a gel cover, the cover does not interfere with the sides of the protector. Once the protector is fitted, you wouldn't know it was on there. The touch sensitivity of the phone is the same as without this protector. This is the 2nd one that I have purchased, which was when the S8 was first released and only a couple of weeks ago did I crack the screen, at first it looked like the phone screen had cracked but it was the protector and there was no damage to my phone. This is an excellent protector and for me the cost does not come into it, there are cheaper ones else where but do not even come close to the quality of this one. If you want to protect your phone screen, do not hesitate and buy this one. I used this with the mounting frame to make sue it fitted perfectly. Works a treat and saved my screen twice. Now on to the 2nd screen protector as the 1st did the job. Very happy! Exactly what I needed, good quality and fair price. To be honest, when I first ordered my screen protector from this website, I thought it was a little bit sketchy. The reviews seemed too good to be true and seemed fake. However, after once I did get the screen protector (and I was amazed by the quality btw) I breathed a sigh of relief. I would honestly consider purchasing from mobilefun the nest time that I need anything for my phone. This product is an ideal protective screen for the S8, fits well and feels very sturdy. Lot of it in the box to fit the cover. Fitted first time no problem. On fitting I have noticed that there is a line on both curved edges which is viable while using your phone. The screen protector has fallen off once and on refitting the touch on the screen now needs more pressure to get it to work, also bits of dust under the glass now. Don't think I would recommend as the lines are a pain! Looks like I will have to keep looking for a screen protector. Fits nice and snug. Would buy again. Had this fitted and looked good. By the end of s couple of weeks it had cracked in multiple places. The protection this product provides is very good, but my own experience was that the top notification menu was much more difficult to access once the protector was fitted. It still worked, but often took 3 swipes to bring down the desired menu. I had no issues with any other area of the screen though. Great protection and so easy to install. The screen protector fits buityffully. Does exactly what it says on its package , an easy fit and a good price. Very good. Easy to apply. Fits phone perfect. Great protection. So got it and put it on perfectly. Immediately noticed that my touch sensitivity on my screen was almost non existent. Due to this I have had to use a lot more pressure when typing. This has caused the screen to crack under this (not overly hard) pressure. Screen scratched with only pocket fluff against it as well. Yes it has protected my screen but not sure if it's worth the extra hassle of using it. Sorry to hear that you are not happy with this screen protector. The application process is where it is important to get installation spot on, if you are slightly off in alignment it can cause issues like you are describing, Always ensure the edges of the screen protector are correctly positioned, then it should not impact screen sensitivity. Hope this helps, if you have any more problems please contact out customer services. I really do like this tempered glass at first, without any problem on the first day. But on the next day start to see dusts at the edge, now the dusts are at both side and it does not stick anymore. Dusts start to come in between the glass and the phone. I still do keep this glass on due to the fact that I spent $29.99 on this. I am very disappointed. At first I was really pleased with the screen protector as it was easy to put on, fitted well and didn't impact on performance. However, a few weeks on the screen has come off whilst in my handbag. I've managed to restick it, but it's only a matter of time before it comes off again and the screen isn't as responsive now. The glass is fine but the sticker at the back which needs to peeled off to apply it, it leaves lines on rhe sides with rainbow effect. The service is great as they have sended me two glasses but the problem is not solved. And I don't want them to waste any of their products anymore. Very easy to prepare and apply, fitted first attempt, tough glass coating but have not had any problems with using touch screen. Would recommend. Have had two. First one fit perfectly and did not affect the sensitivity or display quality, dropped my phone on unevan concrete, it shattered in one corner but saved my phone. Got a replacement where the quality seemed better out of the box but the alcohol pad was bone dry. Persevered with cleaning using my own stuff and applied the new glass, the alignement is aa central as possible. Testing right away, i have minimal sensitivity in the center of the screen, ecen typing this is stressful and the top right hand corner is not sticking. Will try the white dome next i reckon.. The screen protector was very easy to put on. Doesn't reduce the touch sensitivity very much at all. No issues whatsoever after having on for over a month. Even been exposed to water many times and the screen protector did not have any negative effects. I was looking for a good screen protector with a minimum of dust that can stick around the borders and good touch sensitivity. This screen can't do both. Dragging from the top for the notification is difficult, tapping around the center and keyboard area is not responsive. Dust have gone trough the border and under the corner of my screen within weeks. I am very happy with the wrap screen protector for my Samsung 8. I received the S8 screen protector within a wk & installed it without a hitch. We purchased a screen protector from our carrier which fell off within a wk. I am a cell phone nut. Believe me when I tell you that this screen protector is top of the line!! Easy installation,& it looks sickkkkk!! Original screen developed a crack when dirt got under the seal. I contact Mobile Fun and provided a picture and a replacement screen was sent the next day. The screen doesn't hamper any use of the phone and works with the case I have on the back of my phone. Screen protector was easy to put on. Fit my Galaxy S8. Fitted okay. Put phone in my pocket but when I took it out the edge of the "protector " had splintered. Waste of money. Always had good products from Mobile Fun before but very disappointed with this. Prior to purchasing the screen protector I attempted to use another manufacturers glass protector which was horrible. I was afraid that I would not find a product that at a minimum even worked. This glass screen protector is second to none, as well MobileFun and their support!! I highly recommend this product and would not consider purchasing from anywhere else!! Good looking screen protector but dreadful for showing up fingerprints. This is a good looking screen protector which is very easy to fit. The original unprotected screen of my S8 is tough and never showed up any fingermarks. This screen protector gets messy very quickly and requires cleaning two or three times a day or else the display is unreadable in sunlight. Wish I had bought a different make. Not upto the expected expectation. Reagarding the all reviews I read, it did not stand upto the standard. Totally unhappy with the standard. Even if you drop in carpet floor from knee level height, my screen protector was cracked on left middle edge and eventually was cracked at top from left to right. No sign of damage at the top during drop. I am surprised where that came from. There is still gap between actual crack and ''alien" crack. Not recommended if you need a solid and long term screen protector. Good product but not the same as without it. Fingerprints i an issue!! Touch respond nearly perfect. Well worth the money. I advise everyone to go and buy it. Good galaxy s8 glass protector easy to fit. The screen protector was delivered quickly and easy instructions for application, however the side don't seem to be flush with the phone despite following the instructions carefully for the initial application. Other than that, excellent touch response and can't notice a difference with the screen visibility. Smooth easy application, easily fits with my case. Good overall however some touch sensitivity is lost and I find myself pressing the same area multiple times till it works. Also the edges of the protector act as a dust trap. The screen protector fits perfectly and is easy to apply to the screen. Does not leave bubble marks once applied and was compatable with my spigan case. I'm using this screen protector in conjunction with a Spigen Elite case and it all fits perfectly. Very easy to apply and you'd never know it's there when using the touch screen. It does a great job of protecting the screen - my phone fell out of my hand when getting in my car and landed face down on some knobbly tarmac. The screen looked totally ruined when I picked it up and was thinking along the lines of having to get a new handset. But no - the damage was entirely within the protector itself and not a mark on the phone screen itself. I'm pretty disappointed with this product as there was a significant loss of sensitivity and the finger prints were a lot more visible than without the screen protector. I wouldn't recommend this product. Initially got the screen protector with the olixar case in a set. Dropped the phone face down and it bounced twice. Protector smashed in two places but the screen was absolutely fine! Also VERY easy to fit. Pricey but you get what you pay for! Very easy to install , there is a YouTube tutorial but there is no need to watch it. It's my job to put all the screen protectors on everyone's phones in the house and this was the easiest to install by far . Good product well worth the money . Although i have dropped my phone a few times it has cracked easily, so far it is only on the sides. I don't know if there is anything that can eliminate this but to date it is working for me protecting my main glass which I have been through a major shatter in the past also damaging the touch pad - so happy so far. 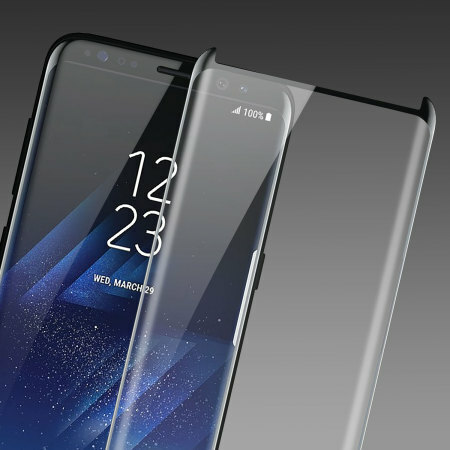 There are many issues reported in respect to glass screen protectors for the S8 due to the curved screen and compatibility with cases. This product is not perfect. I only experienced a very slight diminished sensitivity and not to the extent of some reports. Being perfectly honest I notice the screen sensitivity is perfect with no protector at all but by virtue of adding a protector you would expect a very small amount of diminished sensitivity. Installation was simple and the glass is premium quality to the point you forget the protector is there. I did notice some rainbow effect when the screen was off in the centre ... this is because the glue in on the edge therefore you really need to ensure when you install for the first time the edges are pressed down firmly. I note the rainbow effect cannot be seen when the screen is on. I recently dropped my phone on its edge, the screen protector cracked but the s8 screen is perfectly in tact ... no damage or dents. Ultimately the protector does its job. I will buy another one. I give this a four point 5 out 5 with a point 5 of a mark being dropped just because of the ever so slight drop in sensitivity but not on an annoying noticeable level. Best screen protector for s8 by far. I have one on my S8 plus and wife has one on her S8. We have tried others, this is 2nd to none. Mobile fun.com is a pleasure to deal with, quick response with answering questions, and shipping is quick considering it is from out of the USA!! I went through 4 screen protectors for my galaxy s8 and none of them worked. Even when applied perfectly. They didn't fit right with the curves of the phone and left part of my touch screen unresponsive. This is the only screen protector I've tried that actually fit the curves and didn't ruin my touch response. Thank you, Thank you After 3 different brands finally found glass screen protector that actually works. The olixar tempered glass protector is a great product. Sensitivity is A1 Cannot even tell it's there.! Great protection and easy install.Highly recommend. Happy I found it. No complaints. Excellent profile does what it says. The description on the website was accurate I was not aware that damaged product was exempt from replacement but the supplier very kindly replaced the item.You can't ask for better service than that.The replacement so far has been fine. It is a very durable protector my phone fell on a metal bar and it didnt even scratch. Plus installation was a breeze. There was a little rainbow effect at first but its gone and it fits with all the cases iv tried. We ordered this screen protector and put it on. It was too short to cover the whole screen and didn't adhere properly to the sides of the screen, so within a day there was a layer of dust clinging to the edges of the screen and creeping in. We asked MobileFun for a refund, which they refused to give us; they said they'd send us another 'improved' screen protector. When that arrived, we took it to a shop and asked their Geeks to install it on the phone. The same result: too short; sides don't adhere properly; dust coming in at the sides. Not protecting the screen. I was procrastinating on getting a cover for my phone then it fell out of my locker one day and gave me a heart attack. Since I have had this cover which is seamless and easy to put on looks the part sleek and the touch sensitivity is still just as good. I'm safe in the knowledge now my phone will not crack anytime soon! I purchased this screen protector after watching a review on youtube. The protector broke after 2 weeks of use and I didn't even drop it. The side just cracked somehow. Also the whole reason I purchased this protector is because it was not supposed to collect dust and debri on the sides where it's sticky but it did. Looked good and fitted well with clear instructions and fitting clothes. However screen required a lot of pressure to register a button press. So much so I removed the screen as it made the phone frustrating to use. Sorry to hear you are not happy with this screen protector. If you haven't applied it perfectly, particularly on the sides where the screen protector attaches - this can cause the screen protector in the middle to raise, reducing touch sensitivity. You may be able to carefully remove the screen protector and try again to correct the issue though. Easy to apply, fits just fine with my case and did exactly what it is designed to do.... Dropped my phone and cracked the glass cover. The phone was fine and the glass cover lasted (albeit cracked) until my new one arrived. This was my first go with tempered glass and I won't ever be without one now! Having watched a review that highly recommends this screen protector on youtube I ordered one. Firstly it is both very easy to put on the S8 screen and sits over the screen perfectly and stays in place with my phone inside the UAG Metropolis case which I highly recommend. I have no doubt the Olixar screen protector would stand up to drop and scratch tests successfully. However after 3 days of using my phone with the Olixar on screen I became fed up with the lack of sensitivity on screen particularly playing games or trying to view and enlarge photos or web pages. The sensitivity seems to be ok around the center of the screen but over the remaining area which is most of the screen I would have to say it is at best average. Considering the amazing screen sensitivity Samsung have created on the S8 I cannot recommend the Olixar screen protector if touch is important to you. If you're priority is screen protection over sensitivity go ahead and get one. This glass cover is very easy to install and gives you great protection not losing sensitivity of the digitiser at all. I have never purchased a screen protector for any on my phones before but decided i would given the price of the S8. The service from mobilefun was great & the installation guide was good. It sits perfect with the Moshi case that I'm using. I'm afraid that is where all the good things ended. The screen itself is a fingerprint magnet & needs constant cleaning. The screen edges, left & right, where the adhesive sits are a dust magnet & ruin the look of the screen. This really annoyed me. The screen itself has popped off & I have reapplied it but it hasn't really stuck well given the dust on the screen edges. All in all it is not a product I'd recommend to anyone. This is the most money I ever spent on screenprotector and ironically the one that I like the least. It's the first curved phone I've had and for the money it cost, I am weary of going without a screen protector. -The installation guide /video is extremely helpful and made the installation very straight forward, even for a klutz like me. - Fit is as described, it protects the edges, I've had it on for over a week now and still as securely in place as it was at install. - Protector actually lessens screen visibility. It has such a high shine that bright light/sunshine become an issue. - And my main peeve : This protector is so completely non-oleophobic that I swear it's attracting next'door's fingerprints as well as mine. Microfiber cloth is now a permanent attachment addition. First oleophilic screenprotector ever! Just upgraded to the new S8, purchased an Otterbox without the screen protector so I needed a cover. The unit was easy to attach, fit well with my case, and looks crystal clear. The screen protector and case came in handy when I dropped the phone for the first time. After buying a lot of glass screen protectors including the Alpha of OtherBox and a few other brands, every glass screen protector I put with my Spigen Rugged Armor case just came out after I put the case back in. This screen protector is perfect for me, Spigen I have and the screen works fine and the tach works great. Positive: Easy to fit and leaves no air bubbles. Fits well, sticks well even with a case on the phone. Feels like the natural screen. Protects the curved edges. Reasonable price for product value. Negative: Visible lines along the vertical edges where glass is moulded to fit the curve of the screen. The screen now doesn't respond to light touches. This means when typing often letters are missed out. Very frustrating. I found the installation of the screen protector really easy, just wipe phone clean with wipe provided, peel of the film on the protector and place onto the phone pressing down on the edges to make it stick. It fits well with my Spigen gel case, leaving about a couple mil gap between the case and protector so no lifting up on the sides. I find the touch sensitivity isn't affected too much, occasionally you will need to press a bit harder towards the middle of the screen but for me it's still perfectly useable. A couple of things I wasn't happy with hence only 3 stars is that you can see the glue on the sides of the protector creating a halo at the edge of the screen which doesn't look too great. Also it collects quite a lot of dust round the edges and I'm having to constantly clean fingerprints off of it as it seems to be really prone to them. This protector is near perfect. However, the only con i have for this case is that i had problems with pulling the notifications down from the top. In other words the touch sensitivity wasn't great. Sorry to hear you are not happy with this screen protector. Each Samsung Galaxy S8 phone will have minor differences in the curvature of its screen due to the varying tolerances of the manufacturing process, which can cause issues for all glass screen protectors unfortunately. This can sometimes mean dust can start to attach to any visible glue on the very edge. For my personal taste, I would've changed 2 things on this product. 1. More glue to hold it to the screen. 2. More coverage for the screen on the sided. BUT also remember that because it is case friendly, it can't be much bigger than it already is. So, even though I would love a whole screen screen protector, I know that it can't be done, without sacrificies. It is very easy to install. Feel nice to use compared to the plastic screen protectors, which are a pain to put on. Clarity is perfect. No complaints on the shipping, it was the perfect size package. I would give it a 9 or 9.5 on a scale of 1 to 10. Awesome product! The clear glass protector fit just perfect on my Samsung S8. The fit allows for use with multiple cases and adds yet another level of protection. I highly recommend! The Olixar tempered glass screen protector for our two Samsung Galaxy S8 phones is outstanding. We tried two other types, and the touch was terrible on those. On the Olixar, you couldn't even tell you had a screen protector on. This one had no rainbow effect whatsoever. Wonderful product!